A great day for a swim: Winter water temperatures always stay just above zero Celsius (32 Fahrenheit), even when a layer of ice forms on the surface. From late autumn until spring, a removable bridge connects the small island of Uunisaari with Kaivopuisto, the park that covers Helsinki’s southern shore. On a frosty winter morning, the silence on the island is repeatedly broken by a stream of scantily clad figures scampering between a low sauna building and a jetty before bravely plunging into a large hole cut into the frozen surface of the ocean. 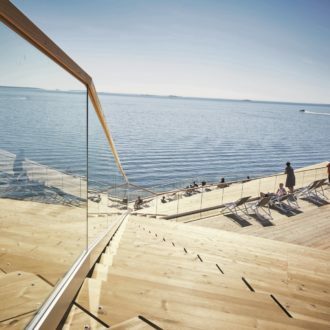 Each winter as many as 150,000 Finns “enjoy” taking regular dips in the chilly lakes and sea bays. People who are unfamiliar with the practice often ask one question: Why? The club has about 220 members, ages 12 to 75, from shipyard workers to managing directors. 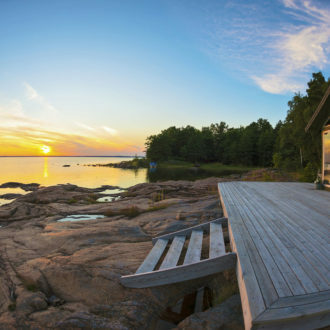 Most live locally, like Sipilä, who takes the plunge at Uunisaari almost every day, even when the sauna is not heated. 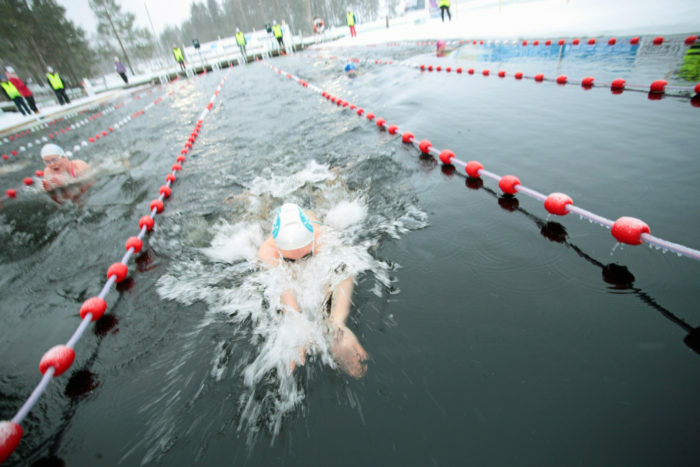 The keenest aficionados still swim at Uunisaari when air temperatures plummet to minus 20 degrees Celsius (minus 4 Fahrenheit), since water temperatures always stay just above zero Celsius (32 Fahrenheit). Scientific studies show that cold immersions can also reduce blood pressure and promote the growth of healthy brown adipose tissue, improving cold tolerance. Cold shocks also trigger the brain’s production of endorphin hormones, which enhance pain resistance and create a sense of euphoria. Finland has over 200 registered winter swimming clubs and facilities, while many more people make smaller ice-holes near their homes using spades or chainsaws. National championships have been held in various locations annually since 1989, though Finns are known to have relished this eccentric pursuit since the 17th century. The first clubs were founded back in the 1920s. Headwear is compulsory – in the shape of conventional bathing caps or silly woolly hats – and frogmen are on standby in case anyone flounders. Though most competitors are here for fun, others take the races very seriously – including some with impressive track records as competitive swimmers or even Olympians. Times are slower than they are at summer events, since competitors start from a standing, shivering position already in the pool, instead of diving in. 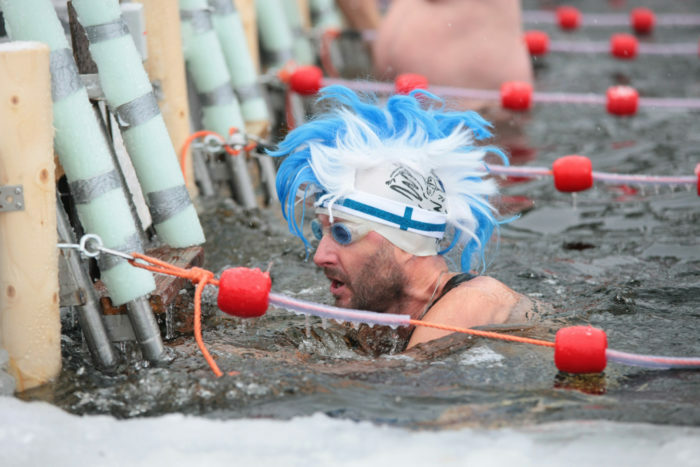 Elina Mäkinen, 23, from Joensuu, recently swam an “ice mile” at two degrees Celsius (35.5 Fahrenheit) at a Wild Water event in Armagh, Ireland, in just over 26 minutes. “I don’t seem to feel the cold too badly, and winter swimming is a great way to test yourself and meet positive people with similar interests,” she says. 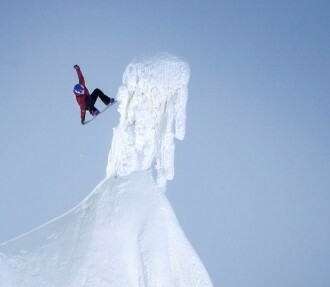 Despite high expectations, snowboarder Enni Rukajärvi didn’t stress about the Olympics. She took home a silver medal.